NEW YORK, New York, September 15, 2010 (ENS) – Critically endangered in the wild, the world’s remaining 3,500 tigers rely for their survival on 42 refuge sites scattered across Asia. These sites encompass just six percent of available tiger habitat, but overhunting, logging, and wildlife trade has forced tigers to cluster there. Once the most fearsome predators on Earth, wild tigers have themselves fallen prey to hunters and the wildlife trade. Loggers have cut down their forest habitat until tigers occupy relatively few reserves. Protection of these sites, with an additional $35 million a year for monitoring and enforcement represents the last and best hope for world’s biggest cats, finds new research published in this International Year of the Tiger. “While the scale of the challenge is enormous, the complexity of effective implementation is not,” said Joe Walston, director of the Wildlife Conservation Society’s Asia Program and lead author of the study. “In the past, overly ambitious and complicated conservation efforts have failed to do the basics: prevent the hunting of tigers and their prey. With 70 percent of the world’s wild tigers in just six percent of their current range, efforts need to focus on securing these sites as the number one priority for the species,” Walston said. The peer-reviewed study, published Tuesday online by PLoS Biology, is authored by scientists from the Wildlife Conservation Society, the University of Cambridge, University of Minnesota and the International Union for the Conservation of Nature’s Species Survival Commission as well as the IUCN/SSC Cat Specialist Group. Financial information was supplied by the Global Environment Facility and the World Bank. The securing of the tiger’s remaining source sites is the most effective and efficient way of not only preventing extinction but seeding a recovery of the wild tiger, the study’s authors say. The researchers also assert that effective conservation efforts focused on these sites are both possible and economically feasible, requiring an additional $35 million a year for increased monitoring and enforcement to enable tiger numbers to double in these last strongholds. According to the paper, fewer than 3,500 tigers remain in the wild, of which only about 1,000 are breeding females. 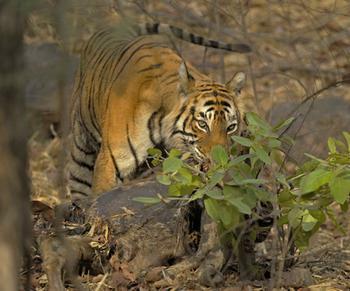 Walston and his co-authors identified 42 tiger source sites, which were defined as sites that contain breeding populations of tigers and have the potential to seed the recovery of tigers across wider landscapes. India was identified as the most important country for the species with 18 source sites. The Indonesian island of Sumatra contains eight source sites, and the Russian Far East contains six. The authors calculate the total required annual cost of effectively managing source sites to be $82 million, which includes the cost of law enforcement, wildlife monitoring, community involvement, and other factors. Much of that sum is already being provided by range state governments themselves, supplemented by international support. The shortfall, $35 million, is needed to intensify proven methods of protection and monitoring on the ground. The authors say that in spite of decades of effort by conservationists, tigers continue to be threatened by overhunting of both tigers and their prey, and by loss and fragmentation of habitat. Much of the decline is being driven by the demand for tiger body parts used in traditional medicines. The study – published online by PLoS Biology – is authored by: Wildlife Conservation Society researchers Joe Walston, John Robinson, Elizabeth Bennett, John Goodrich, Melvin Gumal, Arlyne Johnson, Ullas Karanth, Dale Miquelle, Anak Pattanavibool, Colin Poole, Emma Stokes, Chanthavy Vongkhamheng, and Hariyo Wibisono; Urs Breitenmoser of the IUCN/SSC Cat Specialist Group; Gustavo Fonseca of the Global Environment Facility; Luke Hunter and Alan Rabinowitz of Panthera; Nigel Leader-Williams of the University of Cambridge; Kathy MacKinnon of the World Bank; Dave Smith of the University of Minnesota; and Simon Stuart, chair of the IUCN’s Species Survival Commission.